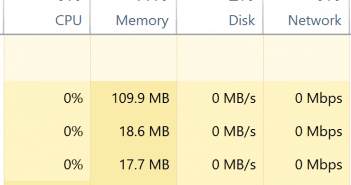 Windows 10 update stuck – what to do? The YouFu K2 Black is about as cheap as gaming keyboards come, but that low cost comes with a high tradeoff. Outside of its RGB backlight, there’s not much here to recommend. Build quality feels cheap and flimsy with lack of attention to detail. While not bad, per se, the design lacks unity and feels like an aftermarket modification. Virtually no premium features to speak of. Limited anti-ghosting and that’s it. Despite its low cost, the quality drop off is so steep that it’s a substantially lower value than every other keyboard we’ve reviewed. Check this in comparison to other similar keyboards in our best gaming keyboards roundup. Over the past month, we’ve been exploring different options for budget gaming keyboards. Keyboards priced at $50 or less as opposed to the high end rigs that cost three times that much or more. Every week we’ve managed to find a new model that shaves roughly $10 off the price of the previous week’s without – at least in most cases – a substantial drop off in quality. This week we’re looking at the YouFu K2 Black, and at a mere $21, we were once again able to shave $10 off the price tag of last week’s Redragon rig. But now we’re starting to enter the range of what your average, ordinary, no frills keyboard costs. Is this the steal of the century or is it just a gussied up version of the generic keyboard you probably already own? I’ll cut right to the chase: the construction quality on this keyboard is not especially great. With the EagleTec keyboard, I pulled it out of the box and was immediately struck with how it looked and felt like it should have cost substantially more than it did. The opposite was true with the YouFu K2 Black. It arrived in cheap, generic packaging, and once opened the keyboard inside didn’t fare much better. The body of the keyboard is lightweight and feels slightly flimsy. There is a thin, aluminum faceplate screwed onto the top surface of the keyboard, but don’t let that fool you. This is an all plastic construction. On the bright side, supposedly you can straight up dunk this thing into a tub of water without any ill-effects. I remain somewhat skeptical of that claim, but since I’m reluctant to test it out for myself, you’ll just have to take their word for it. Unlike the last two keyboards we’ve reviewed, the YouFu K2 Black does not feature mechanical switches, but rather membrane keys. Now, in and of itself that’s not a big deal; I have nothing against membrane switches, and at a measly twenty bucks it would have been absurd for me to expect mechanical switches (even if the Redragon model is only $10 more). And honestly, typing on them is just fine. No different from any other keyboard I’ve ever used. But therein lies the problem: it’s no different from any other keyboard. The ad copy on the Amazon listing (Editorial Note: as far as I could tell, YouFu does not have their own website) claims that the YouFu K2 Black is meant to be “mechanical feeling,” but that’s a load of hooey. The keys are tight and responsive, but no one’s ever going to mistake them for mechanical switches. Again, that’s not a bad thing, necessarily, but if your keyboard has membrane switches, just own it. Don’t try to pull a bait-and-switch with some disingenuous ad copy. Beyond the big areas, though, there’s just a general feeling of shoddy craftsmanship and lack of attention to detail that makes the whole thing feel cheap. 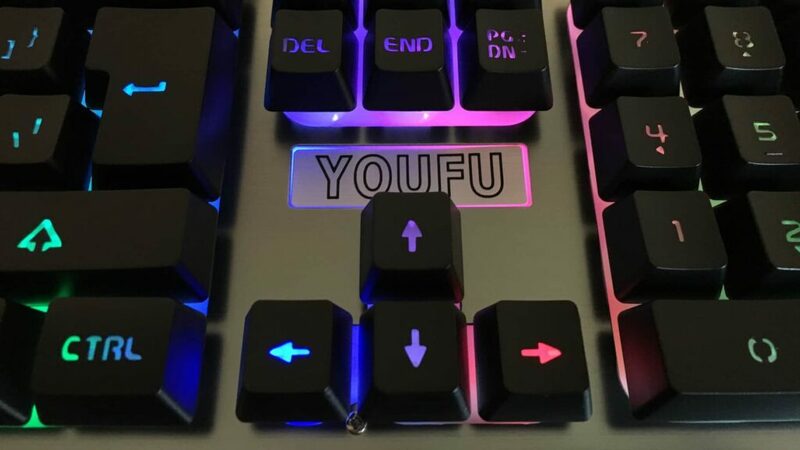 The printing of the letters and symbols on the keycaps is inconsistent leading to uneven lines and places where the backlight doesn’t fully shine through, several of the keycaps themselves have rough edges that weren’t cleaned up from the molding process, YouFu logo is just a metallic sticker stuck onto the plastic surface covering the backlight, and at least one screw meant to secure the aluminum faceplate was missing on the model I was sent. I know all of this is incredibly nitpicky, but it all contributes to the feeling that this is a cheaply made product without a lot of quality control. It’s entirely possible that I was just given a bad one, but even at a mere twenty bucks, this kind of crummy work is not in any way acceptable. Like the last two models we reviewed, when it comes to features, this is a no-frills affair. You’ve got media playback controls mapped to the function keys, as is standard; you’ve got a Windows lock option, which is also fairly standard. Unlike the other keyboards we’ve tested, though, the YouFu K2 Black does not have n-key rollover. 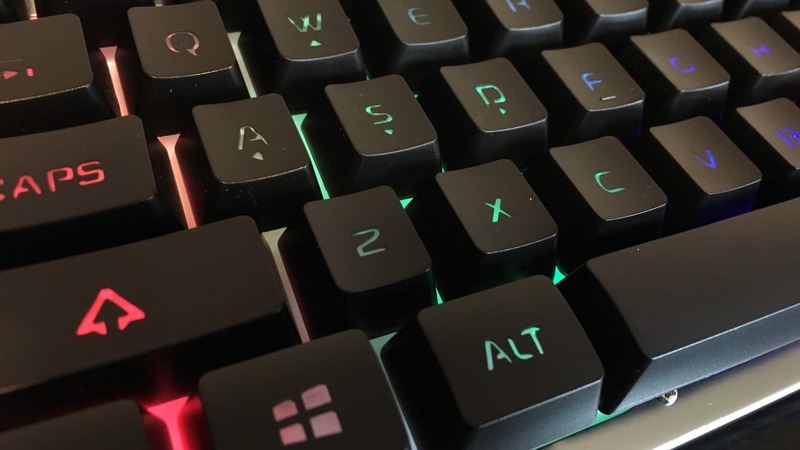 Instead, it has anti-ghosting localized to the keys that are most commonly used in gaming: Shift, Control, Alt, Tab, Q, W, E, A, S, D, Z, X, C, B, the four arrow keys, and the space bar. As always, that’s probably more than sufficient for any realistic scenario, but keep in mind that outside of those keys, this is not a conflict-free design. Speaking of designs, let’s talk about the aesthetic of this thing. 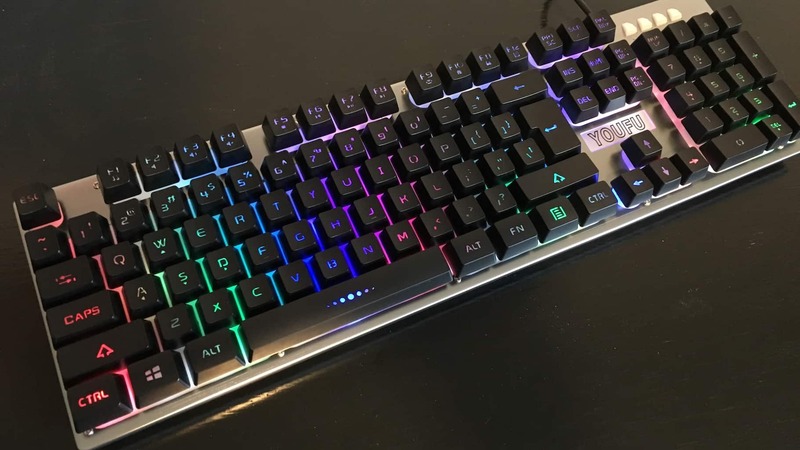 At the top of this review, I asked whether the YouFu K2 Black was just a gussied up version of a generic keyboard, and I can’t think of a more apt way to describe how this thing looks. 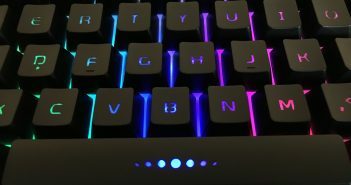 In terms of shape and size, the K2 Black is identical to any run-of-the-mill keyboard you might find, what makes it stand out are the aforementioned metal faceplate and the RGB backlight. This isn’t a unified look that feels truly designed like each of the other keyboards we’ve reviewed. 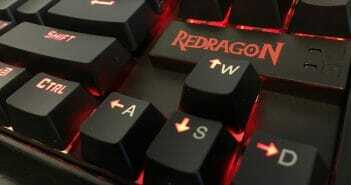 Even the Redragon keyboard we described as, “minimalist to the point of being bland,” felt like a unified design. Instead, it’s taken a fairly standard design and added a few superficial aesthetic touches on top of it. It’s not that it looks bad, necessarily, but it gives the feeling of an aftermarket modification. With that in mind, let’s talk about the backlight which is – if we’re being entirely honest here – the only feature that lends any amount of legitimacy to the classification of this as a “gaming” keyboard. To its credit, the YouFu K2 Black does have a full-color backlight which both the more expensive EagleTec and Redragon keyboards lacked. The backlight also has two separate lighting modes: a static “on” position and a “breathing” mode that fades the backlight through brighter and dimmer settings. In terms of lighting profiles, the YouFu K2 Black does not have the extensive options that the Corsair K55 RGB has, but it’s also less than half the price. 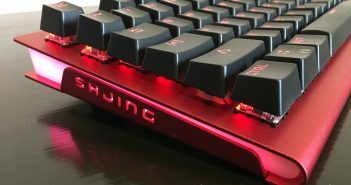 Our past few reviews have all been gaming keyboards in the “budget” category, and they’ve all varied to some extent in the value to cost ratio, but the YouFu K2 Black is the only one we’ve reviewed so far that I’d classify as feeling cheap. Perhaps that’s okay since this is an inexpensive keyboard, but when there’s such a steep drop off in quality between this and the Redragon K552 KUMARA with only a $10 difference between them, it makes it harder to overlook. It’s worse when we start looking outside the world of “gaming” keyboards. There are literally hundreds of other keyboards with better build quality, more unified aesthetic design, and more premium features that cost as much or less than the YouFu K2 Black does. 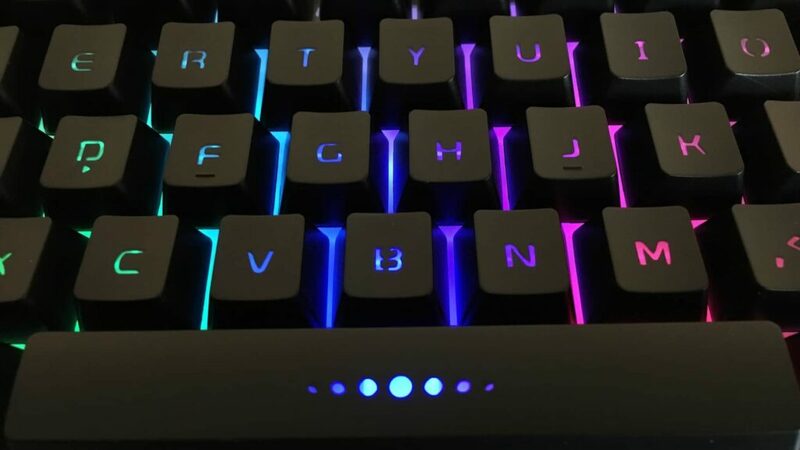 At the end of the day, if you don’t have a lot of money, but you really want that sweet, sweet RGB backlight, this is the keyboard for you. Beyond that though, I can’t in good conscious recommend the YouFu K2 Black. 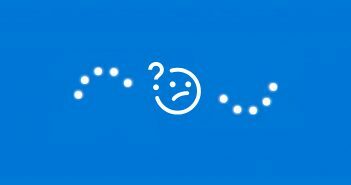 Still stuck? Ask your question in our forum! 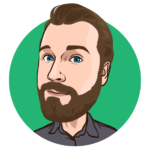 David is a film critic and amateur gadget enthusiast based out of Los Angeles. Copyright 2019 – Win 10 FAQ.